Three winning tickets were drawn on December 4 for this year's raffle quilts. First Prize - Starry, Starry Night, went home with Helen Waisman of Ottawa. 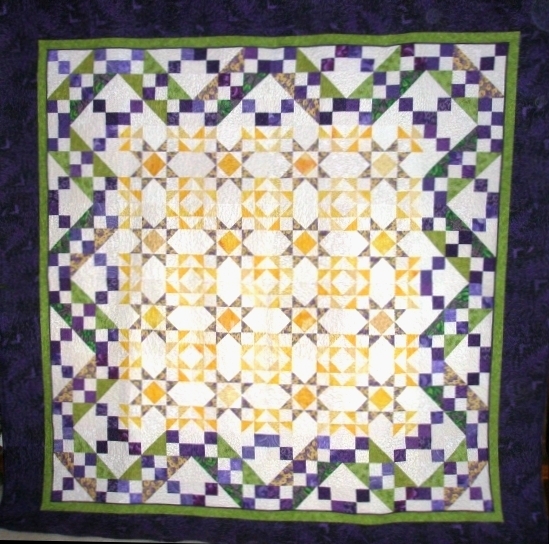 This is a queen-sized quilt covered in stars in yellow, green and lilac, with a stunning purple border. This quilt was appraised at $1,085. Second Prize - Flower Garden, is a lap quilt, about 60" x 60", covered in appliquéd flowers of rose and teal on a gold background, with a blue and pink flowered border. This quilt was appraised at $700, and the lucky winner is Margaret DeFazio of Ottawa. Third Prize - Light of Life, is also a lap quilt, with stunning sunbursts in shades of pinks, blues, lilacs and purples on a black background with a pink border. This quilt was won by Georges Rollin of Gatineau, and is appraised at $540. We would like to offer a very sincere thank you to all our corporate sponsors, individual donors and our dedicated volunteers. It is your generosity and commitment to your community that sustains our efforts and enables Victoria’s Quilts Canada to continue its very important mission. Betty steals the spotlight at the 2010 Fashion Show! Oh, we had a great time at our annual fashion show, held on Saturday, October 31 at the Barrhaven United Church. We munched on the wonderful desserts served with coffee, tea and drinks, and drooled over the offerings at the silent auction. But the best part was seeing the wonderful fashions for fall and winter, presented by Joanne’s of Westgate Mall. There was something for everyone – classic styles for daytime, glamour for evening, and a radical outfit, modelled by Betty Giffin, for the uncompromising free spirit! All the models were members of Victoria’s Quilts Canada. We would like to extend our sincere thanks to Joanne, our Mistress of Ceremonies, who pulled the fashions together, and provided a running commentary on them all. And thank you to our models, who strutted their stuff with great courage. Our thanks also to those who brought the many wonderful desserts. The ticket sales and silent auction raised almost $1400, which will enable Victoria's Quilts Canada to purchase the supplies necessary to continue making quilts. Plans are already underway for next year’s show. We look forward to seeing you there! 2010 Quilt-a-Thon a great success! One hundred and fifteen (115) more people will receive quilts as a result of the very successful Quilt-a-Thon held on Saturday, October 16, at the Church of the Nazarene in Kanata, Ontario. Eighty-five participants sewed, ironed, pinned and tied, and had a great time doing so. There were several changes in the format this year which resulted in more quilts being finished more quickly, and at a lower cost. Participants also brought their own lunch, which enabled us to reduce the registration fee to only $5.00 as opposed to $15.00 last year. Drinks, fruit and vegetables, dessert, and the obligatory chocolate, were all available throughout the day, much of it donated by various enterprises. A big thank you goes out to the 85 people who donated their time and effort in making the Quilt-a-Thon a continuing success. And, we cannot forget the organizers of the event, and our sponsors, who donated goodies for the day. The Quilt-a-Thon offers an opportunity to learn lessons from one year to the next in organizing and participating in the day’s proceedings. Each year, we try to apply those lessons in order to improve the experience – to make it more productive and meaningful to participants. During 2011, additional changes to the format will likely be made, so be sure to check back to hear the latest news. 2010 Raffle quilts are sure to please! This year’s raffle quilts are stunning! Make sure you get your tickets, available from Victoria’s Quilts Canada members, kiosks, or by contacting us by phone (613) 843-9212 or by e-mail to: betty@victoriasquiltscanada.com. All three quilts were donated by Gail Wiebe of Carberry, Manitoba. Second Prize - Flower Garden is a lap quilt, about 60” x 60”, covered in appliquéd flowers of rose and teal on a gold background, with a blue and pink flowered border. The quilt was machine quilted and bound by Hennie Ross Palmer, a member of Victoria’s Quilts Canada. This quilt was appraised at $700. Third Prize - Light of Life is also a lap quilt, with stunning sunburst in shades of pinks, blues, lilacs and purples on a black background with a pink border. This quilt was also machine quilted and bound by Hennie Ross Palmer. This quilt was appraised at $540. Tickets cost a very reasonable $2.00 each, or 3 tickets for $5.00.The draw will take place on December 4, 2010. Thanks to Rabbi Reuven Bulka, of the Congregation Machzikei Hadas in Ottawa, for dedicating his radio program on June 6, 2010 to raise funds for Victoria’s Quilts Canada. We are thrilled that more than $6,000 was raised, which means another 175 people will receive quilts they may otherwise not have received. Listeners heard from a number of people about the positive effects that receiving a quilt had on them, and, from an individual who delivers quilts, about the gratifying sense of spirit she has seen among people she has visited. Victoria’s Quilts Canada greatly appreciates Rabbi Bulka’s participation in the fundraiser. And we offer a big Thank You as well to Steve Madely, host of CFRA’s The Madely Files, who co-chaired the telethon. As well, we would like to thank the Congretation Machzikei Hadas in Ottawa for their assistance and for the use of their facility. Rabbi Bulka’s radio program, Sunday Night with Rabbi Bulka, airs from 9:00 to 11:00 p.m. on 580 CFRA. Welcome to three new Branches! We are pleased to welcome three new Branches to the VQC family: Sunshine Coast, which will be based in Sechelt, British Columbia; Climax, in Saskatchewan; and Tantramar Branch in Amherst, Nova Scotia. Sunshine Coast will be ably managed by Judy Dunphy, and the Branch in Climax will be led by Brenda Thaxter. The Tantramar Branch will be led by veteran Mary Sinclair- Fowler, who previously was the leader in the Laurentian Branch. We wish you a very hearty “Welcome to the VQC family!” to our 24th, 25th, and 26th Branches.